Grammy Award winning artist, Adele, has been Rolling in the Deep in heartache. You, on the other hand, may be rolling in deep levels of formaldehyde found in your home that are wreaking havoc not on your emotional state, but on your health and well-being. What’s alarming is the fact that you may be completely unaware of the potential health risks of daily exposure to these formaldehyde containing products. Formaldehyde is ubiquitous today. It is commonly used in certain insulation materials; pressed-wood products such as particleboard, plywood, and fiberboard (think kitchen cabinets, shelving and subflooring); glues and adhesives; permanent-press fabrics (yes, wrinkle-free sheets, fabrics and trousers); cigarette smoke; paper product coatings; certain disinfectants; adhesives; insect repellents; fuel-burning appliances and even some hair straightening products (such as the Brazilian Blowout) which contain formaldehyde or some derivative of this compound. The reason this is so alarming is due to the fact that formaldehyde is considered a carcinogen; a cancer-causing agent. It may also cause other health problems such as coughing, allergy-like symptoms, throat irritation, skin rashes, and asthma-like symptoms as well. For people who suffer from asthma, their condition could become significantly exacerbated by exposure to formaldehyde. Formaldehyde is actually an organic compound. Don’t be fooled by thinking that because it is organic, it also means it is safe–this is not the case. Formaldehyde is a colorless compound, which can exist in a gaseous form in its natural state, and is often converted into a liquid form for other uses. It is a naturally occurring simple compound, but it is also extremely reactive; meaning it can form other aldehyde based compounds which can be just as dangerous as formaldehyde itself. What Types Of Home Products Contain Formaldehyde? Formaldehyde has so many derivatives that it is difficult to simply identify them in household items and dispose of them properly. Look for any chemical ending in the suffix aldehyde; most likely a derivative of formaldehyde that could be dangerous or deadly in certain circumstances. 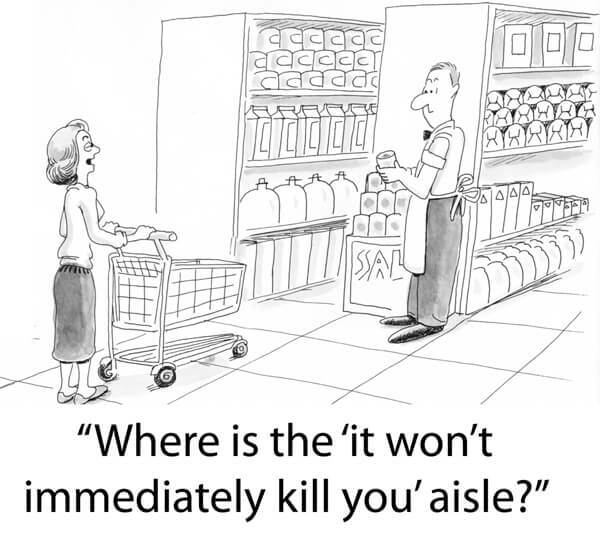 Insecticides, weed killers, and disinfectants are common sources of formaldehyde. Other sources of formaldehyde are actually found in tobacco products, keratin hair treatments, and even car exhaust. Formaldehyde is used as a preservative in labs and funeral homes in order to stop decomposition, which gives some example of just how toxic this substance can be. Did you Know? Composite wood furniture sold in stores can still have toxic levels of formaldehyde until 2013 even though legislation has passed? Why Is Formaldehyde So Dangerous? Aside from being a respiratory irritant which can lead to sinus issues, cough, watery eyes, runny nose, and asthma-like symptoms – formaldehyde is designated a known human carcinogen (cancer-causing substance) by the International Agency for Research on Cancer and as a probable human carcinogen by the U.S. Environmental Protection Agency. Additionally, in 2011, the US National Toxicology Program described formaldehyde as a known carcinogen. Regular exposure to formaldehyde has been shown to have extremely negative effects on human health. Aside from causing different types of cancer, women who are pregnant are at higher rate for their babies to be born with birth defects, premature birth, or miscarriage when exposed to formaldehyde. People with asthma have shown significantly higher asthmatic symptoms upon exposure to formaldehyde, some leading to serious respiratory distress and even death. Because of how common formaldehyde is, and because it is a naturally occurring compound, it may be impossible to completely avoid exposure to it. However, it is possible to limit exposure to substances which contain formaldehyde. If you are at risk for respiratory problems such as asthma, emphysema, COPD, or otherwise compromised pulmonary function, avoid any exposure to formaldehyde possible. Check labels on disinfectants or any other adhesives or insecticides you are planning on purchasing. If the ingredients list formaldehyde or a derivative of formaldehyde, consider another product or wear respiratory protection while using the product. Your long-term health and well-being are definitely not worth the risk. Are there testing kits for this? and go to the HOME TESTS tab. Select Air Test Kits – Airborne from the drop down menu. You will see the Formaldehyde test as the first option. Good luck & let us know how your results turn out. NOTE: The kit includes professional test results from an accredited laboratory! great article. I did a piece for my blog and linked back to you, let me know if you don’t like that sort of thing. I am so happy you are ok with this. Getting people to talk about the oops in the construction of our world view, is so important. Fluoride is currently creeping me out as well as the unintentional toxins in all water bodies. My work through fashionRIP Project creates installations, videos, shows (recycouture in dioramas). Helping each other is the best …actually is natures way. Have you seen the Money Fix? great doc that ties many things together. Wonderful Deborah! Sounds like you are up to some fantastic work. Isn’t this true about nature? She doesn’t over consume, but always has enough and all within works together as a cohesive unit. We can learn so much from nature! Have not seen the Money fix, but you have piqued our interest! Will keep a lookout for it. Here’s to a brighter future indeed :) Have a great weekend!